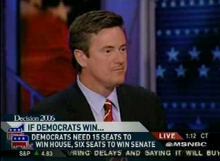 Scarborough: "Why Are The Republicans Against Paper Trails?" Scarborough just asked Pat Buchanan and Bob Shrum why the Republicans are against paper trails on the voting machine. That turned the conversation into a trial of the electronic voting machines, and all three agreed that they were bad. So why are Republicans against the paper trail? I think we all know the answer to that one, but to put it in a more GOP friendly tone for Joe - they are against accountability. That has been highly evident with not only voting machines, but also in the way they govern.